Unison Research launches SH, its first dedicated headphone amplifier | What Hi-Fi? 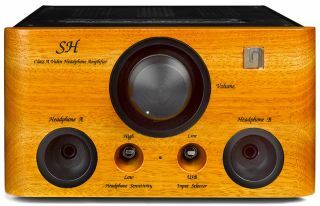 The SH is a single-ended two-stage headphone amplifier that uses valve technology. It's designed to be used with analogue sources and computers. Unison Research has recognised that more and more people are listening to music through headphones at home and has produced the SH to deliver a “world-class sound from a specialised device using the best technology available". The SH is fitted with a linear circuit that Unison Research says produces low negative feedback and an output voltage which is capable of driving a wide range of headphones. The input stage of the SH uses an ECC83 valve while the output uses an EL84, the latter being used as it’s capable of driving the output transformer with “optimal electrical and sound character”. There are two headphone outputs on the SH, connected in parallel and each with their own EL84 valve and a sensitivity switch to accommodate a range of headphone types. Any line-level source can be connected to the unbalanced RCA input but the SH can also support audio files up to 384kHz PCM and DSD 128 thanks to an asynchronous USB input and integrated DAC. The Unison Research SH is available now with a cherry or black faceplate for £1250.